Note: 3 masts, 1 stack, 5 upper staterooms aft and 1 forward. Used T.W. Kirby's patent Hog Rods in hull construction. Engine from GENERAL H.E. PAINE; wrecked at Grand Haven, 1879. 15 miles off Holland, MI. Bound for Buffalo, crew of 17, 11 saved, 6 lost. Wreck found in 2001 by David Trotter. 1881, May 20 Enrolled Grand Haven, MI; valued $110,000.00. 1882, Jun 9 Milwaukee, Wolf & Davidson's Shipyard, machinery repairs. 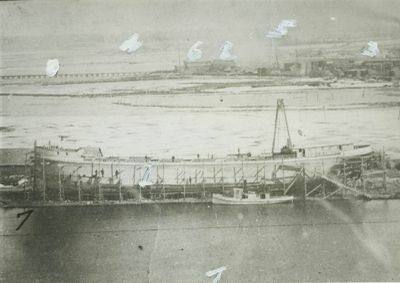 1883, Jul Drydocked after grounding.